Thanks to grants and the generous donations of alumni, scientists, and friends, FHL is able to offer financial assistance to many students taking courses or conducting research at the Laboratories. In addition, there are other potential sources of aid for students to explore, many of them listed on this page. UW students: your first stop should be the UW Office of Financial Aid to explore options available to you there. Other resources for financial assistance are listed at the bottom of this page. Each of these has its own requirements and application process. As you discover additional resources that are not listed here, please let us know by emailing Dr. Megan Dethier so we can add them. FHL scholarships are made possible by generous donations from alumni, scientists, and friends of the Laboratories. Most students who apply for scholarships receive some assistance, with the amount awarded depending not only on student merit and need, but also on the funding available for a particular course. For summer courses, typical awards are $1000 – $3000; for spring and autumn courses, the usual range is $100 – $1000. Because we try to support as many students as possible, we can’t provide full financial aid for anyone. The expectation is that you will contribute to the expenses of taking an FHL course; most applicants use a variety of sources, e.g. personal, departmental, and other. Who is eligible to apply for an FHL scholarships? We accept applications from any student taking an FHL course except for UW undergraduates who are eligible for a Mary Gates Endowment scholarship in spring or autumn (see below). Submit your request as part of your application to an FHL course or program; instructions are provided on the application. When are FHL scholarship applications due? Materials are due when you submit your application for the course or program. We will consider aid requests after we’ve made admissions decisions. Eligible UW undergraduates taking OCEAN 492 (15 credits) or FHL 470 (6 credits) in spring or autumn may apply for a scholarship from the Mary Gates Endowment (MGE). MGE scholarships for OCEAN 492 are $3,000 and for FHL 470 $1,250 each. Who is eligible to apply for an MGE scholarship? Submit your request as part of your application to an FHL course or program. If you are eligible for MGE, you will see complete instructions about how to apply for the scholarship on the FHL application. If you have otherwise completed the FHL application but are not yet ready with the MGE materials, please go ahead and submit the MGE application so we can review it for admissions; you can fill out the section for your MGE request later (due dates noted below). Write a Personal Statement (ca. 1 page) describing your motivation for participating in the Research Apprenticeship or Experience, with a focus on your long-term goals. Upload it to your FHL application in the MGE section. Request a Letter of Recommendation from a UW faculty member (preferred) or a college-level instructor, and give that person the link for uploading the letter; information and the link are provided on the FHL application. When are MGE scholarship applications due? Complete MGE applications (including letters of recommendation) are due as noted below. We will consider MGE applications after we’ve made admissions decisions. Spring quarter: February 1 (when course applications are due). Autumn quarter, late review & notification: August 15 (notification in September). The FHL Blinks – NSF REU – BEACON Summer Internship Program seeks to link undergraduate students with scientist-mentors as collaborators in marine science research projects. Students selected to participate will be provided with financial support to meet costs of room, board, round trip travel. Additionally, they may receive a stipend. Please note: these internships are highly competitive. Who is eligible to apply for a summer internship? Summer internships are predominantly for undergraduate students, though post baccalaureate and graduate students may apply. An NSF REU Site grant, which funds many of the internships, supports only U.S. citizens or permanent residents during their undergraduate careers. The FHL Blinks Endowment also funds internships, and supports students who bring diversity to the FHL student body in any phase of their undergraduate or graduate career. How do I apply and when are internship applications due? See our page on summer internships for more information on the program, how to apply, and application due date. FHL fellowships are made possible by generous donations from alumni, scientists, and friends of the Laboratories. 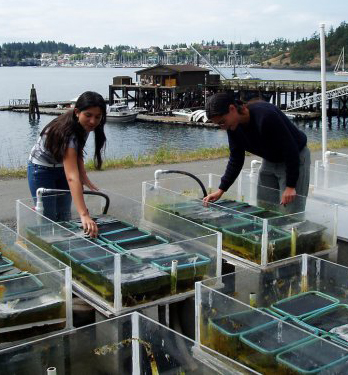 Fellowships are available for qualified applicants to conduct independent marine science research at UW-Friday Harbor Laboratories. Who is eligible to apply for an FHL fellowship? Any student who wishes to conduct independent research in marine sciences at FHL is eligible to apply for a fellowship. Most fellowships are awarded to graduate students, though we accept applications from advanced undergraduates, post baccalaureate students, and post docs. See our page on student research fellowships for more information on how to apply and the sources of support. When are FHL fellowship applications due? Applications are welcome at any time. However, we strongly encourage applicants to apply before February 1 of each year and awards are generally made in March. Libbie H. Hyman Memorial Scholarship: for students to take courses or to pursue research on invertebrates at a field station. Examples of FHL courses that would qualify include Marine Invertebrate Zoology and Comparative Invertebrate Embryology. Advanced undergraduates or first or second year graduate students are eligible to apply. Application deadline typically in early February. Phycological Society of America Fellowships: for taking courses on algae at a field station. UW Biology – FHL Award: for UW Biology undergraduates taking courses or doing research at Friday Harbor Labs in spring or summer. Awards up to $1,500 each. Application deadline in 2019 is Feb 4, for award to be used within one year of winter quarter. American Academy of Underwater Science: for research using SCUBA. Graduate student (masters and doctoral) members of AAUS are eligible. Application deadline in 2019 is June 30. American Microscopical Society Student Research Fellowships: for summer research projects involving microscopy. Fellowships of up to $1000 each. Any graduate or undergraduate student member of AMS is eligible to apply, with the exception of past fellowship recipients. Application deadline for 2018: March 16.
International Phycological Society: Paul Silva grants for conducting or presenting research on algae. Awards of $500 each. Graduate student members of IPS are eligible to apply. Application deadlines May 30 and December 31. The International Women’s Fishing Association: for research in marine sciences. Graduate students in marine sciences at a US institution are eligible. Application deadline March 1. Lerner-Gray Grants: for research on marine life (not including botany) and environments. Graduate (doctoral) students and early career researchers are eligible to apply. Awards $500-$2,500 each. Application deadline March 15. The Lewis and Clark Fund for Exploration and Field Research: for exploratory field studies involving the collection of specimens and data. Graduate (doctoral only) students are eligible to apply. Application deadline for 2018: Nov 8. Libbie H. Hyman Memorial Scholarship: for students to take courses or to pursue research on invertebrates at a field station. Advanced undergraduates or first or second year graduate students are eligible to apply. Application deadline typically in early February. Nancy Foster Scholarship Program: for research in marine science, especially for women and minorities. Graduate students (masters and doctoral) in marine sciences, who are US citizens or permanent residents attending a UW institution, are eligible to apply. Application deadline in 2019 will be in Dec.
National Shellfisheries Association: for research on shellfish (molluscan or crustacean), several grant opportunities. NOAA National Estuarine Research Reserves (NERR) Graduate Research Fellowship: available locally through Padilla Bay, but at other NERRs as well. Year-long fellowships. Some of the work must be done in an NERR (e.g. as one of many field sites), but otherwise, funds may be used on anything related to the study. Application deadline Nov 1. Pacific Northwest Shell Club: for research on Pacific Northwest mollusks. Senior undergraduates (supervised), graduate students, and post docs at Pacific Northwest institutions are eligible to apply. Application deadline April 1. PADI Foundation: for research using SCUBA. Application deadline in 2019 was Jan 6. Phycological Society of America Fellowships: for research on algae, several grant opportunities. Society for Integrative & Comparative Biology (SICB) Fellowship of Graduate Student Travel: for travel to & other expenses at research laboratories or field sites. Graduate student members of SICB are eligible to apply. Application deadline in 2018 was Oct 17. Society for Integrative & Comparative Biology (SICB) Grant-in-Aid of Research: for research in integrative & comparative biology. Graduate student members of SICB are eligible to apply. Application deadline in 2018 was Oct 17. Sigma Xi: for student research, generally for travel. Undergraduate and graduate students eligible. Applications may require sponsorship by a Sigma Xi member; contact FHL if you need help with this part. Application deadlines March 15 and Oct 1. UW Biology Dept Scholarships & Awards: for UW Biology undergraduates to conduct research or take courses. Several opportunities. UW Library Research Award for UW undergraduates working on a project that involves use of library and other information resources. Multiple $1000 grants available each year. Application deadline in May. Many academic departments at most universities will contribute travel and sometimes partial tuition. Sometimes undergraduate institutions offer alumni fellowships to current graduate students. UC Berkeley has a good list of biology-related funding, some of which could be relevant for students studying at FHL.